In search of a new Guild Head. At the end of this year I have been the Guild Head for two very inactive years. I have decided, that as I clearly don't have the possibility to be a very active Guild Head, it is my time to step down and let someone else lead the guild with new energy. I'm now in search of a successor. Do you have interest in leading the guild to a new and better era? Please let me know (petronilla.of.london (.at.) gmail.com) if you'd like to take the position. 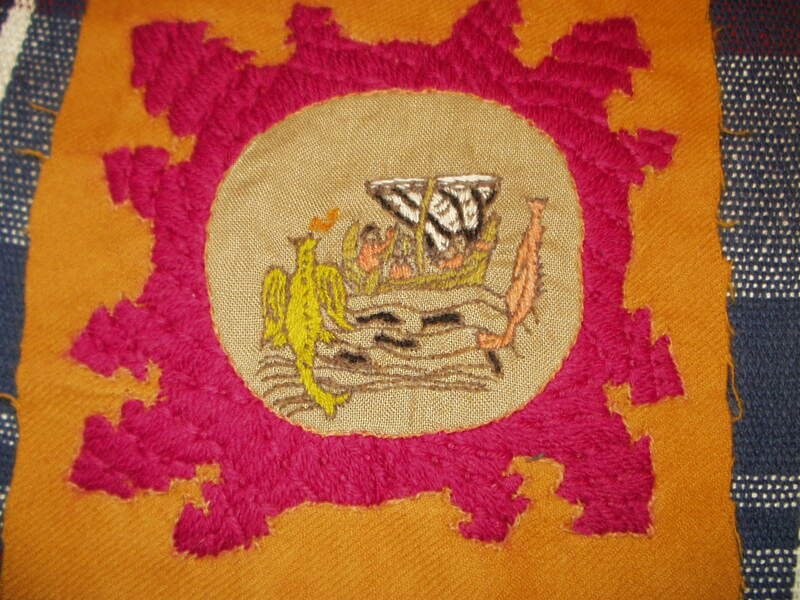 You don't need to be a master embroiderer or the queen/king of research. What we need is a person who is interested and willing to try. Some experience about blogs and forums or about delegating these things to someone who does them better would be very helpful. I will of course help my successor, if I possibly can. Think about it. The Guild is in need of you! PS. We now have our own group on Facebook as well! It is time for a new Guild Challenge. Lady Renika came up with an idea for a nice challenge which is a good one for making our fair kingdom an even more beautiful place. 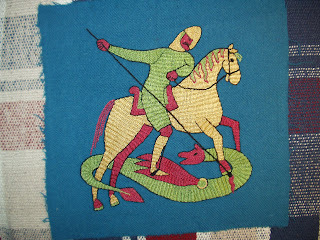 The challenge is to make embroidered garb - for you, not for someone else. Make a bit of research of embroidered garb from a chosen region/period, preferably with some picture material, and then make your own interpretation of it. The challenge will start now and end by 12th night. Pictures and research info will be posted on the guild blog. 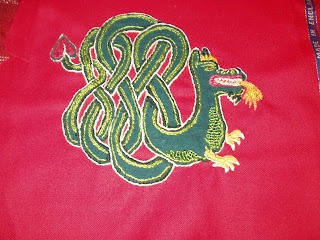 followers of the Dragon's Needle Embroidery Guild mailing list! Furthermore I wish you a great new year - I will resign by the end of the year and I am very happy to announce that lady Petronilla will become the next guild head. 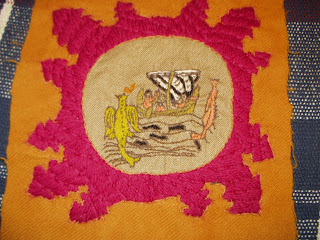 I would like to tell you more about lady Petronilla, but I know that you soon will get to know more about her with her introduction in the first newsletter of the year - I would just like to say that she is a very gentle lady with awesome embroidery skills and that I very enjoyed all of her classes, as well as seeing her lovely embroidery projects in person. So, I think this are really great news for the guild and I am looking forward to all new ideas and projects Petronilla will start in the future - may the guild grow and prosper with the help of Petronillas enthusiasm and fresh power. 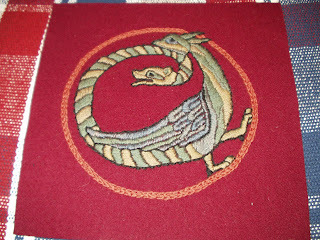 dear gentle members of the "Dragon's Needle Embroidery Guild" and "-eMail Group"! I apologize in advance but due to my rather long vacation in the kingdom of Meridies, which will start tomorrow, this newsletter will be the last one for this year and this will be also the 2nd report for this year. 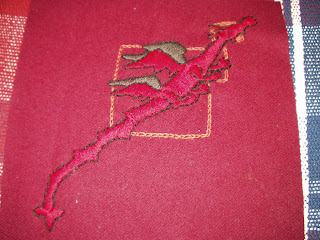 As some of you might know, I became the guild head of the Dragons's Needle Embroidery Guild at the 24th September 2007 - soon completing my 5th year as guild head - therefore I asked the local guild heads to appoint a successor for the position of the guild head and am waiting for the information who will take over this position because I am planning to resign as guild head and local guild head at the end of this year - I am very looking forward to hand over the guild and its future to a new and enthusiastic lord or lady. I am also very looking forward to all the beautiful events I will attend in Meridies and wish you all also a great autumn and many lovely events here in Drachenwald - enjoy your time and help to make our dream as beautiful as possible for yourself and all others around you. Summer is fast approaching and there are many beautiful events all over Drachenwald to look forward too - I wish you a great summer! Since the last report one new member joined the guild and we have now a total of 65 members. Sneak-peak as a new years gift! 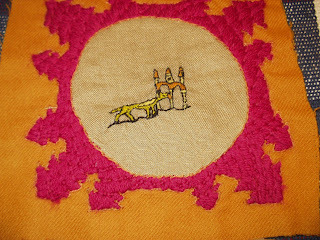 We are working on with the wallhanging, Fru Katarina Juhanantytär has started sewing the masterpiece together. Here is some pictures of the working-on-progess. 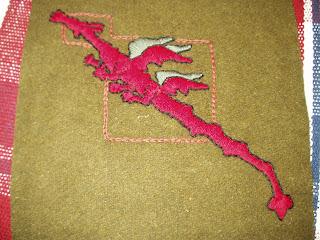 First is a picture from the very beginning, we laid the finished patches over the red wool which will be used as the backround. All patches haven't arrived yet, so this is just the first look out for the project. 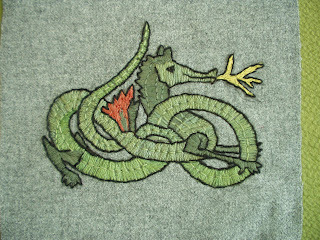 And here is another picture with more patches, we have a lot of dragons! 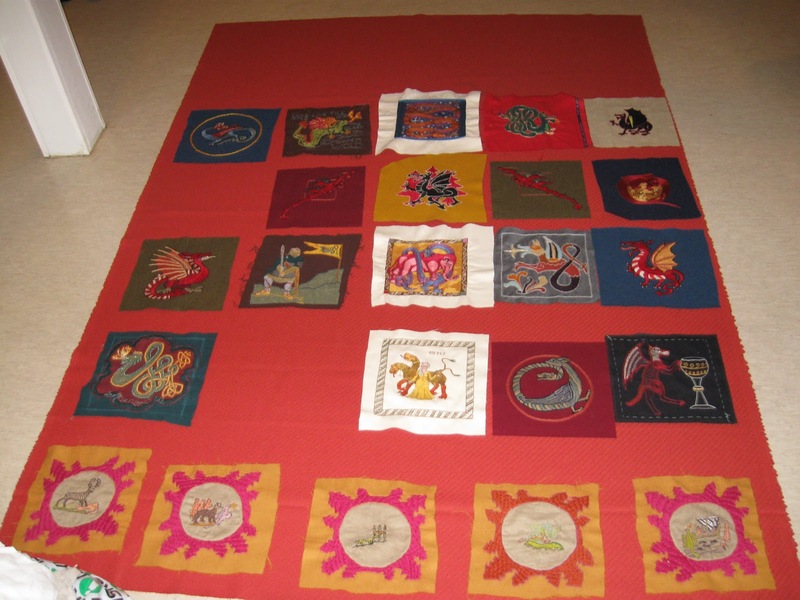 When this picture was taken, two rows of patches (the middle-row with the Drahcenwald's dragon, and the lowest row with five dragons on same backround) were already sewed on. At the moment we got even more patches and for a while we where short three patches to get it to match with the row with five patches. Luckily for me, Fru Katarina and Lady Magdalen Yrjänäntytär volunteered to do one more patch each, so the wallhanging is complete. 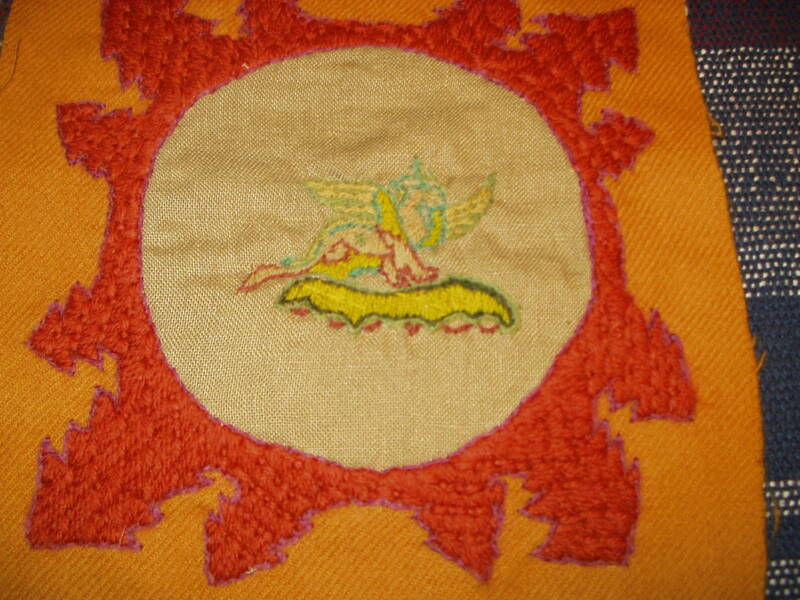 The wallhanging will be finished and showed in the midsummer coronation in Aarnimetsä. I will send more pictures then, but all who can join us there, please come and see it. 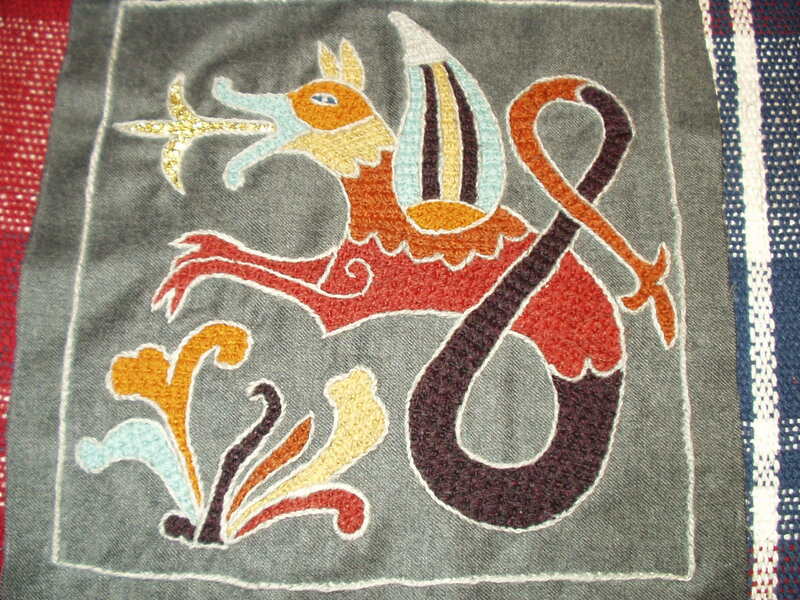 Fru Katarina Juhanasdotter's green dragon, that looks very seahorse-style for me. 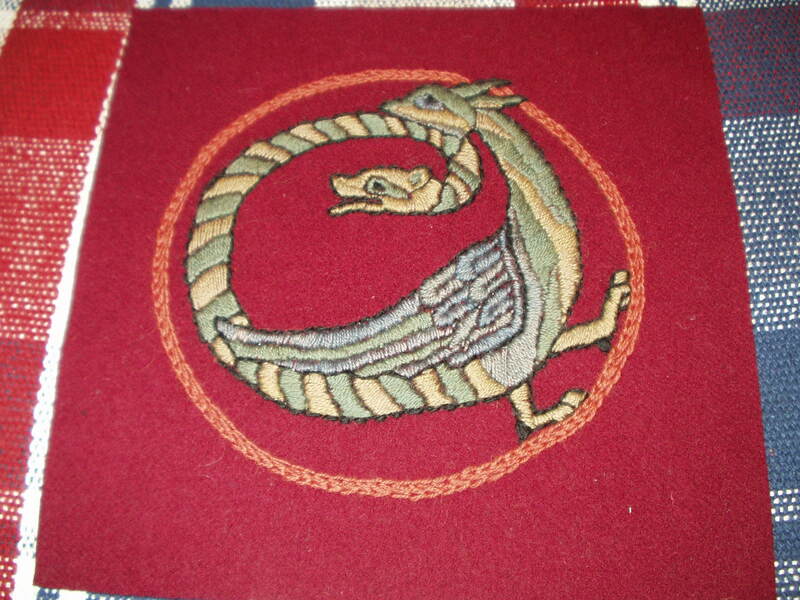 Lady Magdalena Yrjänäntytär's dragon, I think this is one of her first patches for the project, such lovely colours. Enjoy these pictures. 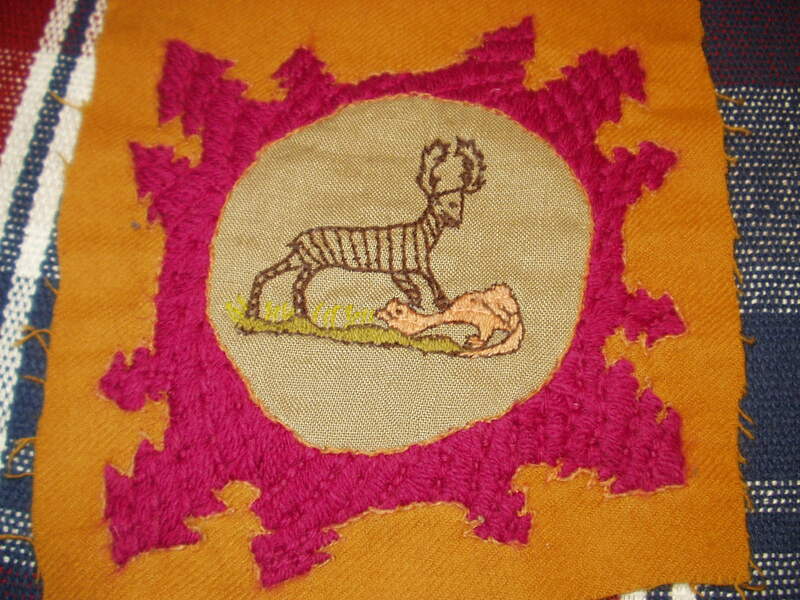 We will promise that the wallhanging will be seen in the Midsummer Coronation and will leave you staggering! I hope you all good health, best of luck and most happiest year in society. 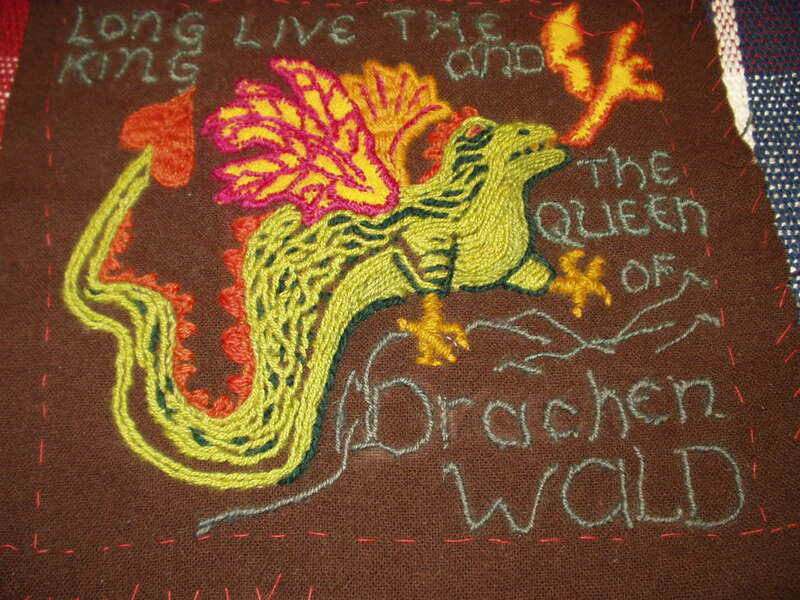 Long live Drachenwald! 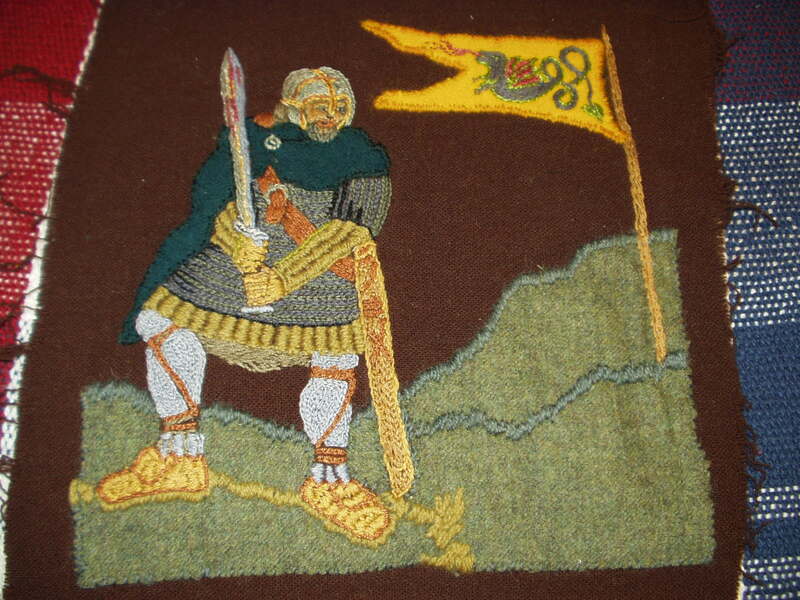 - In you service, Fru Ida Juhanantytär, Senescal of Miehonlinna, guild-eldest of the Aarnimetsä Embroidery. 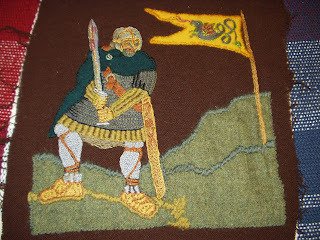 This month the newsletter comes to you with some delay because of my long vacation in the beautiful kingdom of Meridies - I got to see beautiful embroidery at the A&S display at Gulf Wars and got to know many embroiderers of this very interesting kingdom. 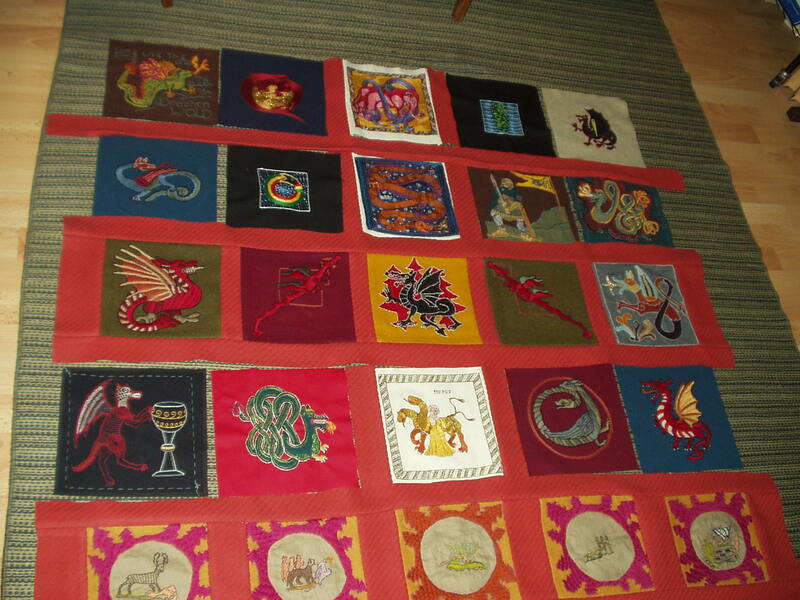 Renika was so kind to post some pictures of the beautiful patches for last years Guild Project "We have Dragons" - I am very looking forward to seeing more pictures of the patches and finally of the finished wallhanging. We have 65 members now - I heartily welcome Cathryn of Chester from the Middle Kingdom to the Dragon's Needle Embroidery Guild. - The 1st Guild Project 2010 - "Coat of Arms Wallhanging for Drachenwald"
- The 2nd Guild Project 2011 - "We have Dragons"
For my two squares I decided to go with something African as I thought that everyone else would go for the traditional European or Chinese dragons. Since African legends don't do dragons as such, I went for two water serpents. Both pieces are in cotton perle on wool fabric. The first is Nyaminyami, the god of the Zambezi River in Zimbabwe. His wife lives in the Kariba Gorge, and when the dam was built they were separated. The local people believe that one day Nyaminyami will destroy the dam and be reunited with his wife. I guess he's like a local Loch Ness Monster, there have been many sightings and people have apparently disappeared and been eaten by him. Most of the images I've seen of him are carvings in wood and stone, so I thought I'd give him some nice water colours. The other serpent I chose is Ayida-Weddo, a voodoo legend from Benin in West Africa. 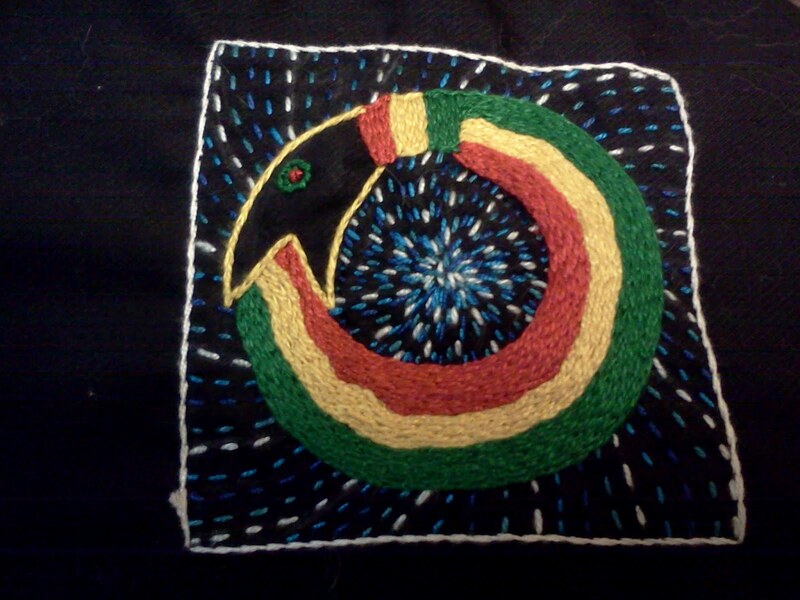 Ayido-Weddo, also called the Rainbow Serpent, is the wife of Damballah, a goddess of fertility and part of the creation myth of the Fon people. I did her in the colours of the Rastafarian flag just because :). I wish you a great 2012 and hope everyone of you had a great New Year's Eve. The year 2012 already starts with a very interesting information - the guild welcomes a new local guild head in Aarnimetsä. My name is Fru Ida Juhanantytär. 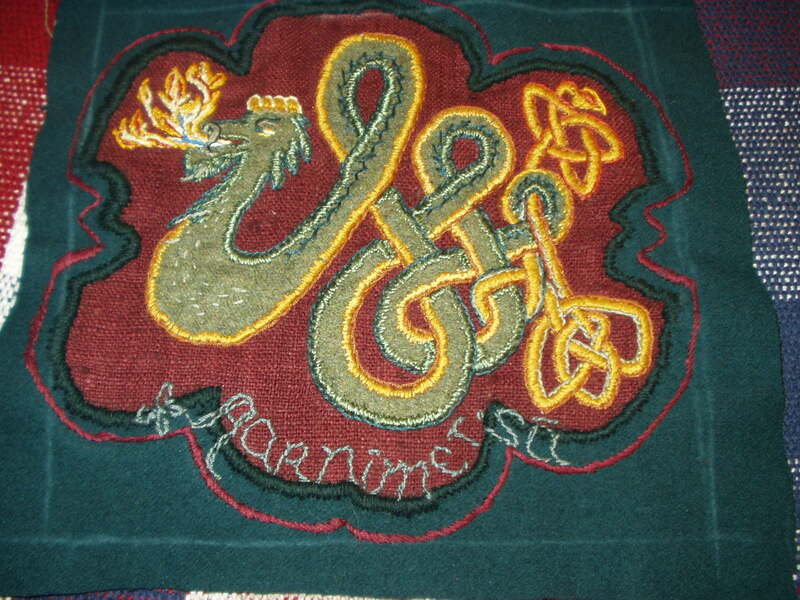 And I got a really good post as the new head of the Aarnimetsä’s embroidery guild. Right after those words I have to start thanking and praising my predecessor, Donna Fiora, who has done big work by sitting us all in the same circle, and helped sharing our secrets among each other. 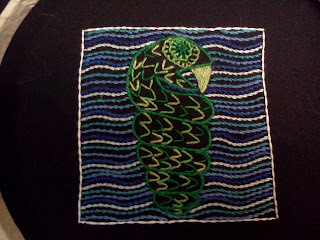 And she somehow got us all to confess that there are no secrets in embroidery, there’s just passion and learning. 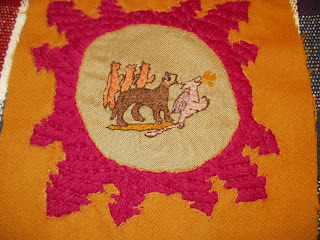 We have lot of skilful embroiders in Aarnimetsä, and I think our guilds purpose is to gather all of us into the same place. Our guild is the meeting point, showroom, study and gossip house for our own passion: stitches, yarns, needles and hundreds of different ways to create something unique from textiles. I hope that we keep on meeting in cantons and events, showing our best and worst and keep gathering new and old embroiders together. I started my embroiding by using thick wool-yarn on fleece, it was something on a hood, it’s still unfinished and my big sister has it somewhere just to scare me some day. That’s how I started at my SCA-lifestyle somewhere circa 1998. My frame is always round, wooden, light one, and last time I counted I had it in five different sizes. I always lose my scissors during big works, and I keep on looking for that perfect needle. 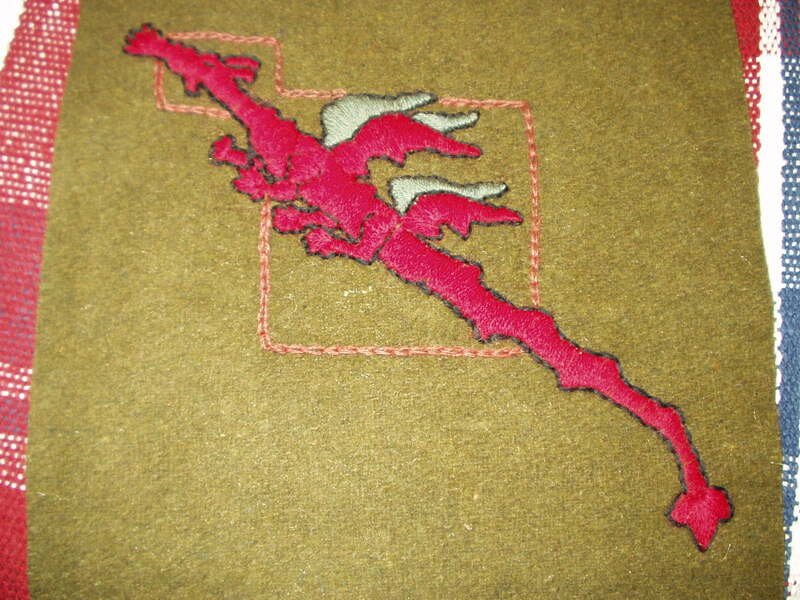 My favourite stitches are nowadays split-stitch or change-stitch, but I also like satin-, and padded-stitch. I am a bit dyslexic and it seems that it really matters over counted-techniques, like blackwork. I work more by free hand or try to learn styles like they used in Opus Anglicanum. I’m also the seneschal of Miehonlinna, canton in the South-East Finland. I was founding Miehonlinna in circa 2000. We are active but small group, very lovely people. In mundane I work half-time as a potter, and full day as cleaner lady at hospital. I read books a lot. I watch detective-DVDs while doing my textile crafts. I live in South-West Finland, even I’m originally from the eastern side of the country. If I don’t get my daily amount of black tea I get cranky, and my motto is to always have a good picnic, nevertheless what else the day would bring to me. And I love baking. We still have 64 members. So how is the challenge going? Here's my (Renikas) contribution, finished just now and I aim to ship it this weekend. This is the dragons den, filled with jewels and precious things. 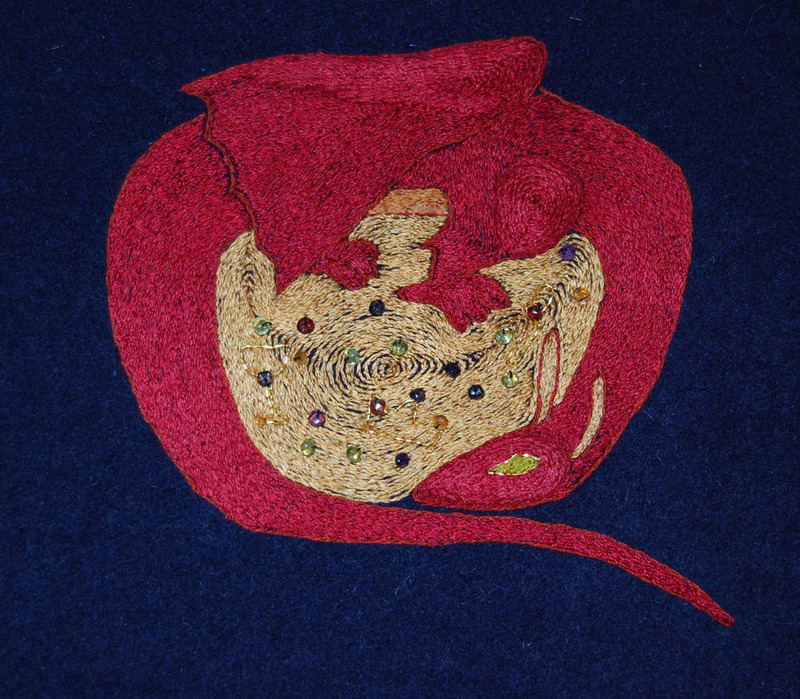 Embroidery in red and golden silk on dark blue wool. I have stitched some small pieces of red cloth on the dragons head, knee and elbow in order to create more of a 3D-effect and then covered it with silk in split-stitch. The jewels are glass beads and then I outlined some artefacts with gold thread. My lords and ladies. Greetings from Aarnimetsä! I must show you pictures of all these wonderful patches which have arrived for the guilds next wallhanging, The "We have dragons"-wallhanging... and we surely do have lot of dragons! I'm posting these photos as a new local guild elder of Aarnimetsä region, And it's great to step into such a lovely pair of guild elder slippers from my predecessor, Donna Fiora, who has made a great job by inspiring all these skillful hands of Aarnimetsä to work with these patches. Here are no less than 14 wonderlfull patches, all made in Aarnimetsa! 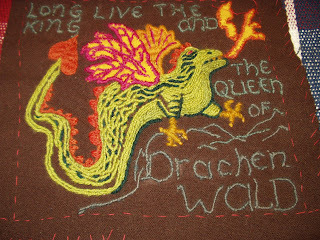 Her first dragon is calling "long live the king and queen of Drachenwald" over the mountain top. Maria Taavistytär's second dragon, called by her as The Brother-in-law, for the first dragon. 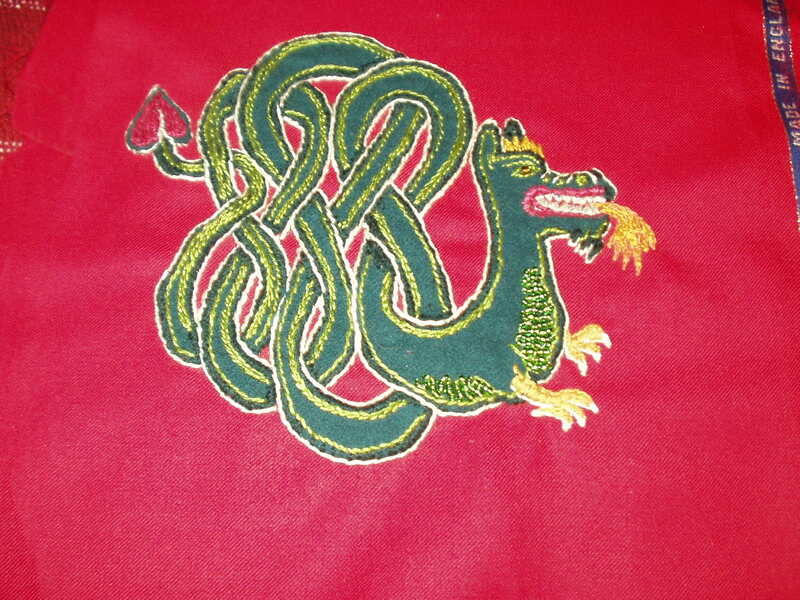 Maria Taavintytär's thrid dragon, red backgroud has been inlaid into the blue one by stiching. And she has also made this brave knight, who is fighting under a dragon pennant! Next patch is beatiful work by Beata. I simply love the colours of this work. Next four Dragons were suprise to me, if you may. These are made by my skillfull big sister, Fru Kattarina Juhanantytär, who is a great seamstress. Now I found out that she is an good at embroidery too! 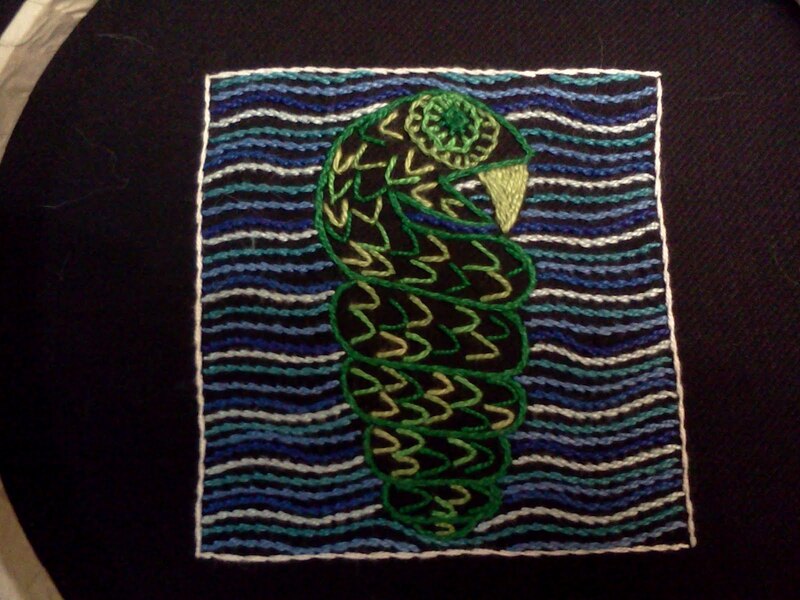 She started embroidering in one night after ten- or fifteen-year pause. And these are what she made..
First after the long pause, she said it took few tries, but still. The second and the third dragons. And even more lovely works from Aarnimetsä. "the one who saves, has it." I must introduce you Lady Gytha Bielke, the senescall of the Canton of Unikankare. She tells me these tiny dragons were meant for another project, but she felt inspired by dragons and decided to use her works as a center for bigger patches. Her first pink dragon is surrounded by dogs. Second one didn't have any better luck with deer. This dragon is under a lion.. poor thing! But, never mess with dragons! Here's one burning down a building! And here are a whole buch of dragons are frying up a sailing boat and her crew in the blazing winds of horror. 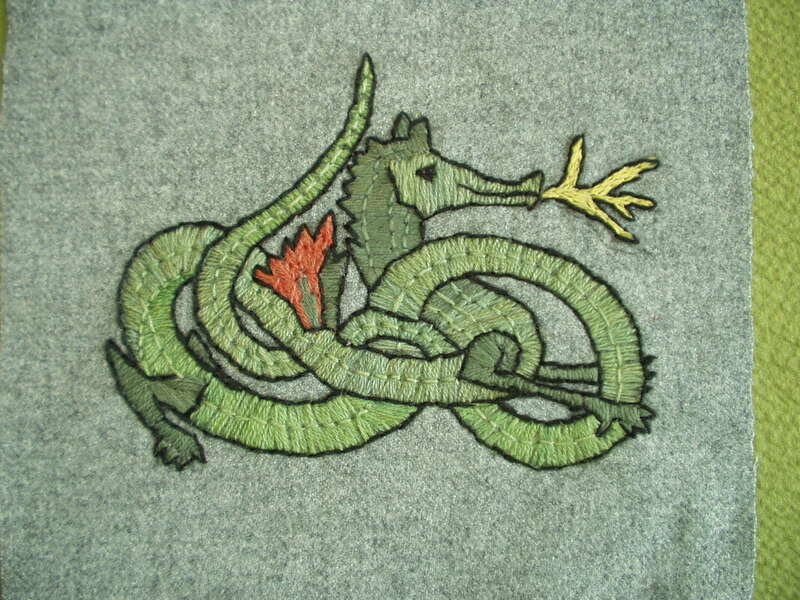 Aren't these patches most clever way to tell stories about dragons? I wish I could tell you even more about these lovely patches. 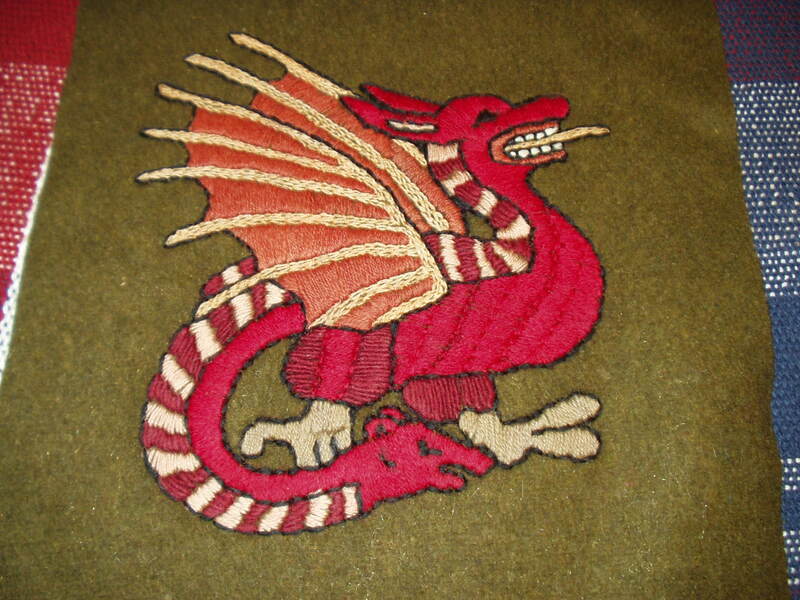 If any one of these lovely embroiders would like to tell us more about her work, please send me a note! 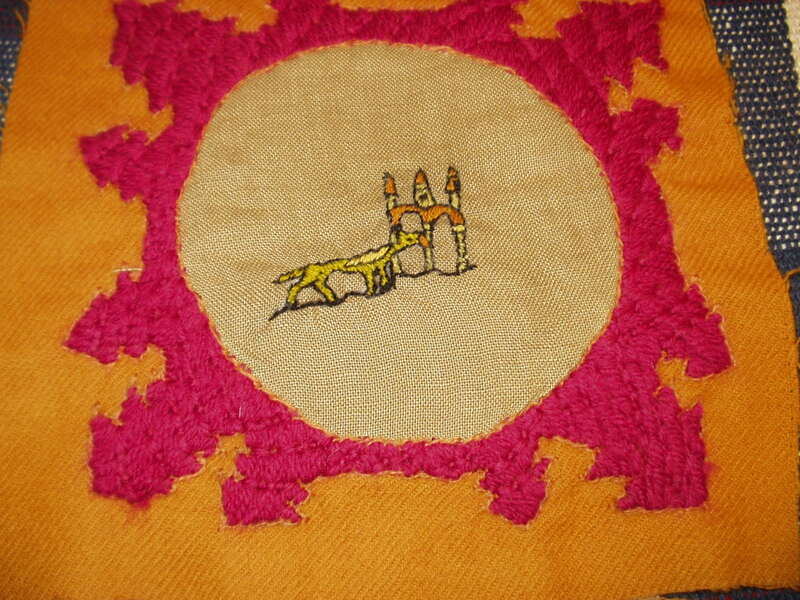 Last but not least, Fru Kattarina Juhanantytär has promised to sew together the wallhanging. So please, to send in your own work for the wallhanging, please contact me for the address. November already started and December isn't far away - therefore I wish you all a wonderful christmas time - I hope your time will be filled with nice events, love and joy. I am very sorry but due to a very busy mundane life I wasn't able to send out a newsletter for October - in the future I will try to send out a guild newsletter at least every 2 - 3 months. 2nd Guild Project - "We have Dragons"
to contact me if you are interested!! 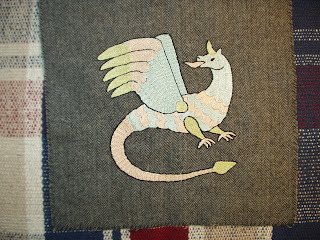 more dragons - this is the time to embroider it! Fiora for her great help. Since the last report three new members joined the guild and we have now a total of 64 members. * 01.2011 - 10.2011 - second Guild project for 2011 "We have Dragons"